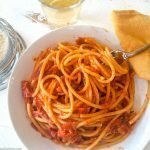 Bucatini all'Amatriciana is a wonderful weeknight pasta dish made with pancetta bacon, onion, white wine, crushed tomatoes and Pecorino Romano cheese. It is fast to make and delicious for adults and kids alike. Get the pasta water ready. Add salt to large pot of water and bring to a boil. Keep on low boil until ready to cook the bucatini. In a large fry pan on the stovetop, slowly cook the pancetta over medium heat for 5-10 minutes until the fat is rendered and the pancetta is slightly crisp. Remove the pancetta with a slotted spoon and reserve, but leave the fat in the pan. Turn the heat to medium high and add the olive oil. When the oil is glistening, add the red onion, red and black pepper and cook for 5 minutes or until the onions are wilted. Turn off the heat and deglaze the pan with the white wine. Cook over medium high heat for 2 minutes or until the alcohol evaporates. Crush the whole tomatoes with your hands and add them to the pan. Add the cooked pancetta back to the pan. Add ¼ cup reserved tomato juice to the sauce. With a wooden spoon, mix the pancetta, onion and tomatoes until incorporated. Cook, uncovered, over medium low heat for 10 - 15 minutes to reduce the sauce. While the sauce is simmering, bring the pasta water back to a full boil. Add the bucatini and cook 10 minutes or until a la dente. When the pasta is done, remove from the water with tongs, and transfer to the pan with the sauce. Mix the pasta and sauce until every strand is fully coated. If too dry, add another ¼ cup reserved tomato juice and mix. Turn off heat and add the pecorino cheese, tossing well. Serve immediately with extra Pecorino cheese.